Peter Greenaway’s latest film “Que Viva Eistenstein” is very much a homage to Russian filmmaker Sergei Eisenstein (1898-1948). “To me, he is the greatest film director that cinema in its 120 year existence has ever had the good fortune to be associated with. So it was not a flash in the pan desire to make this film about the greatest film director ever. When I was about 17, I was an art student in London – that was in the very late 1950s – and I discovered him completely by accident. Since then, I have been extremely fascinated by this extraordinary film director. I think I have read everything that he ever wrote – at least if it’s translated in English, because I don’t speak or read Russian. He was also a brilliant lecturer and an amazing teacher,” British film director Peter Greenaway says when I asked him why he chose to make a film about Eisenstein (1898-1948) over one of his American colleagues and contemporary silent film pioneers D.W. Griffith (1875-1948). Another reason why Mr. Greenaway has such huge admiration for his hero Eisenstein, is because the Russian film director, also a film theorist, is respectfully considered to be ‘the father of montage’ or the ‘pioneer of montage’ and one of cinema’s founding fathers. Mr. Greenaway, an editor himself and very familiar with the importance of editing a film properly, knows how to grab the attention of the audience at the right moment. “The film editor is the gatekeeper to what the audience gets to see,” says the visionary film lecturer, director-screenwriter and former editor, also a BAFTA winner whose screen credits as a filmmaker-screenwriter include “The Draughtman’s Contract” (1982), “A Zed and Two Noughts” (1985), “The Belly of an Architect” (1987) and “The Cook, the Thief, His Wife & Her Lover (1989), which launched the career of actress Helen Mirren. His later efforts include “Nightwatching” (2007), “Goltzius and the Pelican Company” (2012) and upcoming projects such as “Walking in Paris” (2015) and another film about Eisenteins life in motion pictures, to be shot later this year on the American East Coast. 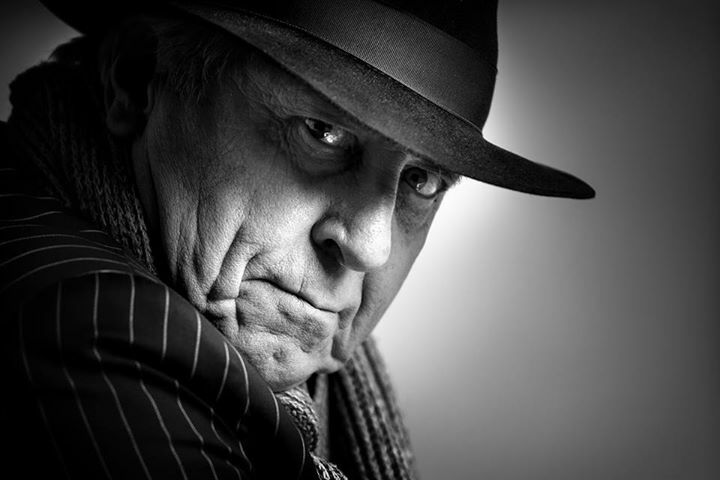 So after “8 ½ Women” (1999), Mr. Greenaway’s tribute to Italian director Federico Fellini, he now celebrates another master of the European cinema. “Que Viva Eisenstein!” depicts the Russian film pioneer’s tempestuous ten-day love affair with a male guide in Mexico (both men played by Finnish actor Elmer Bäck and Mexican actor Luis Alberti) in the early 1930s and can be considered a semi-experimental film focusing on a crucial period in Eisenstein’s life while working there on “Que Viva Mexico!” which was later abandoned. 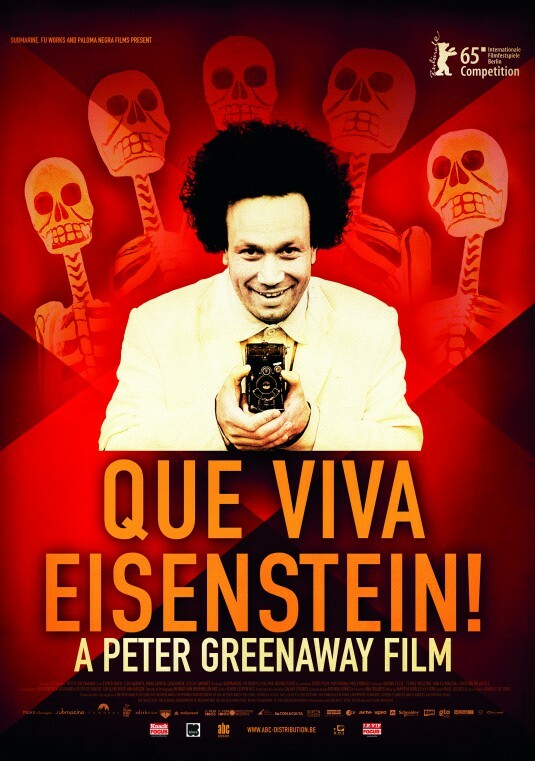 With the typical Greenawayian ingredients, his followers may recognize his powerful visual style; the logical structure of his storytelling points out how his brilliant mind works and, as a highly intelligent philosopher of cinema – also due to the film’s content – “Que Viva Eisenstein!” aims at mature audiences in art houses. Your films are stylish, powerful, challenging, stunningly filmed, sometimes difficult to watch, but always worthwhile: would you agree with that? I don’t try to make difficult films. Maybe it has to do with my cultural baggage and my interest in history, and I am also trained as a painter, so I think all these things come together and necessarily must create a subject, a content and also the language of what I do. There are general ideas which I would always wish to be associated with, but I think they are very general on part of European culture. You’re an all-round and versatile artist in many areas. Where do you focus the most on? If you were my tax collector, I would have to say that I am a filmmaker (laughs). But, I don’t know, my publisher thinks I’m a writer, I was trained as a painter, and I have people who offer me painting exhibitions, but I think that’s got a lot to do where they come from rather than where I come from. I am 73 years old, and I am still waiting to decide what I should do when I grow up. But I think it’s quite nice to keep it all fluid, isn’t it? So many people should not necessarily be described by their job occupation. A man who’s a butcher all his life might be fascinated by safaris in Africa, or something completely different. So the actual raison d’être, if you like, is not always necessarily related to what we publicly do. Would you agree with that? Yes, but since you are creative, very productive and so multitalented, is film for you the best way to express yourself? No. Painting is far more important. You know, I believe cinema is dying very quickly now. Its democratization, the fact that we don’t do it on celluloid anymore, the fact that everybody has a laptop, a mobile phone or a cam recorder… everybody can be a filmmaker now. So that elitism has disappeared, and that’s a really good thing. But it has also changed the nature of filmmaking. I think my great-grandchildren will say to their fathers, ‘Cinema, what was that?’ I think it will disappear in about three generations. But that’s not true about the major art forms invented by the Greeks which include literature, painting, music and architecture. These were invented thousands of years ago and they’re still with us. The evidence of these major art forms is very simple: I can take a little grease from the side of my nose and wipe it out. I’ve made a painting. I can stand in a corner and laugh. I’ve made theater. All these things are very elemental and very simple to everybody in the world. But cinema is fantastically complicated. It requires a huge community of people to work with, it is often expensive – it doesn’t always have to be expensive, but it is. Also, when you have to relate to it, you have to go to dark spaces. Now, you and I are not nocturnal animals, so what are we doing in the dark anyway? There are so many artificial circumstances about cinema that it cannot last. Also, I can’t see a plug here… But if I were to pull the plug out of the wall: no more cinema, you know what I mean? Maybe cinema has not been around long enough, compared to the other art forms? It can still grow? Yes, maybe it’s too soon, it’s only been going for 120 years, compared to painting that’s been going on for thousands of years. So, maybe cinema hasn’t been going long enough, but I certainly believe it’s not the seventh art. You know, [French painter] Bazaine once said, ‘Cinema is a combination of theater, literature and, if you’re very lucky, a little painting.’ We don’t really have an imagistic cinema, we have a text-based cinema, and not only does it perpetuate itself in narratives and storytelling – which is a literary pursuit and not a visual pursuit – but all the paintings are certainly non-narrative. The very best paintings stand on their own, they don’t have to tell a story, why should cinema have to tell a story? So I think cinema is slaved storytelling, there are far too many writers who are turning cinema into a form of an illustrated literature, which is not cinema. I feel very pessimistic about the notion of the cinema that we have ended up with. Cinema now is bedtime stories for adults. That’s why I tried to make a film like “Que Viva Eisenstein!”, a film about film and images. As a filmmaker, you can be compared with Pedro Almodovar or Lars von Trier. You all have a very personal approach, you succeed in making your own films and you’re able to reach your audience. Is it difficult to do that, getting your projects financed, have final cut….? It’s a struggle. Always a big struggle. It’s very difficult to get the film industry to really understand what cinema is really about. They go for the easy option: they essentially make films for the audiences, rather than for the inventor. It is the same with a lot of film critics: they write for the lobby, for the audience, and not for the maker, because they need to be loved, they need to make a communication with their audience. Which seems to be a shortsighted way of doing it, because if you’re going to continue to write about cinema, you’ve got to make cinema long-lasting and healthy. There are so many films that we’ve seen over and over again, it’s not interesting anymore. When you see a film, it happens so often that after five minutes, you know what’s going to happen, you know who the bad guys are, and you know the sense of irony. Maybe we have seen too many films, maybe we got tired of what they represent. So I believe that, like the filmmakers you mentioned, Almodovar and Lars von Trier, you have to keep reinventing all the time. Cinema, like any art form, has to keep reinventing itself, otherwise it becomes boring and dull. That’s always an enormous challenge. That explains your interest in painting? Yes, painting is more valuable to me. You could define cinema as a medium of artificial light, but the first four painters who painted artificial light all lived around the year 1600: Caravaggio [1571-1660], Pieter Paul Rubens [1577-1640], Diego Velázquez [1599-1660], and Rembrandt [1606-1669]. Which means they may also be the first great filmmakers. I studied artistry all my life, there are many other painters that I really admire, like Picasso who also reinvented himself constantly, or the Belgian surrealists who were very profound, I think. I am more interested in classical painters and their use of the grid, and my films are very symmetrical and rigid, they’re related very much to the grid. You can see that also in “Que Viva Eisenstein!”: there’s great use of architecture, architectonic organization of the space is very important. The visual impact of your films is always a major asset. I suppose that’s why you always collaborate with the same cinematographers: first Sacha Vierny of “Hiroshima mon amour”  and Luis Buñuel’s “Belle de Jour” , and after he passed away in 2001, you started collaborating with Reinier van Brummelen. To what extent is that an advantage to you? They second-guess you. You get to know one another so well. When I made “Nightwatching” , I started experimenting, trying something different, and cinematographer Reinier van Brummelen – who like me was a pupil of Sacha Vierny – said to me, ‘You can’t do that.’ So there’s a way that they understand what you do and they know what your vocabulary is. When you slightly change, they may feel a little bit uneasy. Next to the amazing photography of “Que Viva Eisenstein!”, there’s also the stunning performance of Eisenstein by Finnish actor Elmer Bäck. Where and how did you find him? It took us a very long time to find him. I also wanted to use a lot of his footage, drawings and photographs of Eisenstein and if I wanted to someone to play that part, I also needed him to look a little bit like Eisenstein. I looked all over the world and we had several casting directors: on the American West Coast, the East Coast, in Rome, Moscow, St Petersburg, London, Amsterdam. On top of that, it was very difficult to find the right actor who had the ability to handle the language. In Moscow I had several people at the casting studio who said, ‘Please, cast me as Eisenstein.’ But most Russian actors don’t speak very good English and they would say, ‘Give me six month and I will learn English if you give me the part.’ Now, I wanted to find an actor who would temporarily give me his heart, soul, brain and body in the services of the depiction of a very human, very emotionally and anatomically naked – an Einstein who was vomiting, weeping, sweating, howling and making love – this was never going to be a hagiography. I wanted a recognizable cinematic portrait of ten days in the life of a very great filmmaker, but there was to be no worshipful genuflection. So it had to be a male actor aged 33, the same age as Eisenstein was in 1931. But then I found Elmer Bäck, a Finnish actor, who really does understand the language and you can really believe him. The script is very English, full of rhyming and chiming, alliteration, game playing and so on: the text is very Anglophile, very much using the language, so we needed someone who spoke English very well. Elmer Bäck was a very good mimic with a Finnish accent which is a little exotic to us in Western Europe, and he adopted this Russian accent. I’m not sure the people in Vladivostok will agree with me, but I think the people in Western Europe and probably California will be convinced. He also had to gain some weight in order to become this rather plump, massively haired Russian. So finding the right actor is very important. I once made a film “Prospero’s Books”  with John Gielgud. I remember he said to me, ‘If you tell me what shoes I should wear to play the part, then I’ll find the character.’ So for him, the shoes were very important. I suppose all actors have a sort of a trick to try and help them to understand what they think they’re trying to do. Posted in Director-screenwriter, Film Talk and tagged 8 1/2 Women, A Zed and Two Noughts, BAFTA, Belle de Jour, Caravaggio, D.W. Griffith, Diego Velázquez, Elmer Bäck, Federico Fellini, Goltzius and the Pelican Company, Helen Mirren, Hiroshima mon amour, Lars von Trier, Luis Alberti, Luis Buñuel, Nightwatching, Pablo Picasso, Pedro Almodovar, Peter Greenaway, Pieter Paul Rubens, Que Viva Eisenstein, Que Viva Mexico, Reinier van Brummelen, Rembrandt, Sacha Vierny, Sergei Eisenstein, The Belly of an Architect, The Cook the Thief His Wife & Her Lover, The Draughtman's Contract, Walking in Paris. Bookmark the permalink.